HookLogic is offering help to those directly affected by the disaster that struck Oklahoma earlier this month. For dealers in affected areas whose businesses were damaged by the devastating tornados, we will offset the monthly fees and incentives for the next three months. If your Oklahoma-based dealership isn't directly affected, you can pass these savings along to the most appropriate local charity that needs it the most. We know how greatly this tragedy is impacting our customers and industry friends. We commend those that have stepped up to help those impacted by the tornadoes, and hope that this support effort proves helpful to those of you that may have been affected. Our team is proactively reaching out to our customers in the Oklahoma area. If you would like to learn more or get in touch with us regarding this effort, please don’t hesitate to contact us at autosupport@hooklogic.com. Dealer ThinkTank, a group of auto and sales experts that provide insights and strategies for the auto industry, visited Boston last week. I was lucky to able to sit in on the conference, representing HookLogic AutoHook. While the topics all focused on how to compete in a automotive digital world, I was struck by the theme of “trust” that ran through the day. It seems like the dealership industry is facing some of the strongest challenges in this new data-rich, transparent, hyper-connected world. Studies have shown that car dealers rank lower in terms of trust than nearly every other profession. Now contrast that with the internet, where consumers have the ability to control their experience, find copious amounts of data in minimal time and manage communications more selectively than ever. Then add in the increased impact of consumer-to-consumer transactions. It’s no wonder dealerships are struggling to find their way in the internet age. 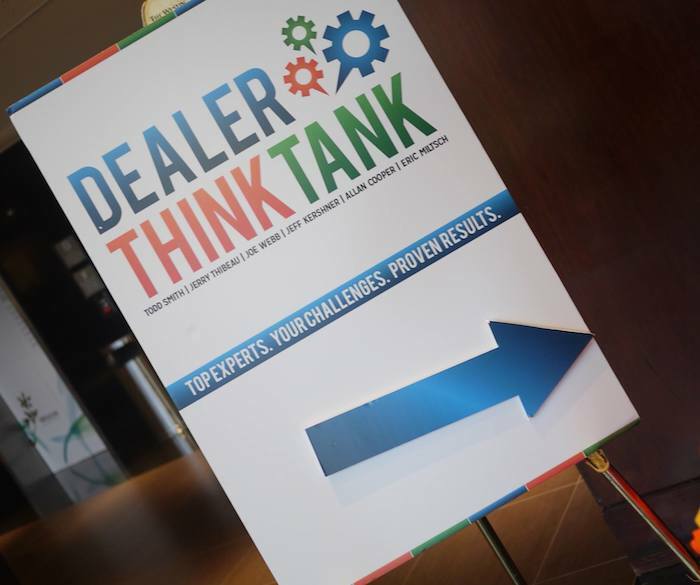 The Dealer ThinkTank pros had several ideas on how to improve the sales process to improve both real and perceived trust, most of which focused on improving and controlling the information flow, while still maintaining credibility and transparency. My favorite idea of the day, thanks to our very own Jeff Kershner , who presented at the day, was the recommendation that dealerships give consumers pre-loaded tablets as soon as they enter the showroom. Not only do you immediately entrust them with an expensive piece of equipment, but you give them a chance to do a lot of research, without feeling like they need to look somewhere else. There’s no end to the information you can provide to potential customers (the importance of providing content being a theme echoed by Eric Miltsch). This idea dovetails exactly with HookLogic’s AutoHook solution for dealerships, where consumers are given a gift card incentive to physically show up at a dealership. When a consumer goes to the dealership to redeem their incentive, they get it immediately, within 30 second of walking in the door. They don’t have to sit through a sales pitch, jump through hoops or fill out massive input forms – all of which can both frustrate them and jeopardize the tenuous trust that dealerships are trying to promote. The goal of AutoHook is simply to get qualified customers in the door, where the dealership’s sales professionals can then manage the interaction. Combine the two ideas, giving consumers tablets on which they can both redeem their incentive and then browse relevant content, and you just might have dealership magic.